Scent Description: Vanilla intertwines with a spice cabinet of cinnamon, clove, allspice, kissed with sugar. Hints of nutmeg and fruits peak out from the heart notes. Fill your home with the powerful aromas of flowers, a bakery, freshness or one of our exclusive scent blends to relax you and your guests while having peace of mind knowing that your candles are safer for the environment, your home and safer to breathe. 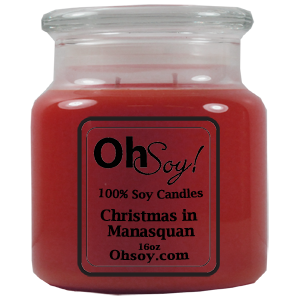 Illuminate your room and your senses with our beautifully fragrant, hand poured OhSoy!® Soy Candles today! "Our 100% soy wax jar candles are crafted with one or two all natural cotton or hemp core wicks to ensure an even and beautiful burn."